Joseph Mathieson in Art & Photography Culture & Arts on 8 November, 2017. It is puzzling that modern society does not take album artwork seriously. We are familiar with the iconic sleeves- Dark Side of the Moon; The Velvet Underground & Nico; most Beatles albums- but they are not subject to a systematic critique in the way that modern art is. I suspect that this is to do with elitist attitudes- that pop music isn’t worth critique- as much as the fact that pop music is a comparatively recent art form. 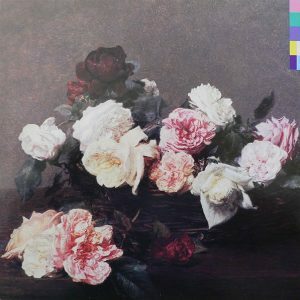 The picture above shows the artwork to Power, Corruption and Lies, the second album of New Order. Designed by Factory associate Peter Saville, it meshes together Fantin-Latour’s 1890 work A Basket of Roses with coloured squares in corner. Unifying it all is the thematic contradiction of the entire image. A Basket of Roses is a luxuriant, even decadent piece pitted against what seems purely functional- what essentially appears as a printer colour test gone wrong. Traditional floral still-life is appropriated ironically by something more reminiscent of the industrial North West than wealthy 19th century French society. There seems to be a poke being made at the supposedly mutually exclusive spheres in which ‘high’ and ‘low’ art exist. The more creatively we think the more we can derive from an image, and this has the result of changing the foundations on which we base our further study. For instance, the coloured blocks on the cover of this record are, if you can decipher it, a colour code, stipulated by a simple but not immediately obvious colour wheel on the back of the record. They read simply ‘FACT75’, ie. the 75th product of Factory Records. So what we have here is a reversal of sorts: from when we thought it could be just a printer malfunction that was kept for purely aesthetic purposes, to actually having a use. This means that there was never a contradiction between aesthetic and function in the first place. Regardless of what we think of these points, the process of this album’s marketing in 1983 is worth considering. Fantin-Latour’s subjects and clientele were overwhelmingly upper middle class; the ‘haute-bourgeoisie’. Similarly A Basket of Roses is now found in the London National Gallery, an institution implicitly catered to the wealthier in society. How radical it must have been to have this single artefact mass-produced, to be found in every music shop and Woolworths in every town across the UK in 1983. Tellingly, initially suspicious of the appropriation, The National Gallery acquiesced to Factory director Tony Wilson after his assertion that this- high art- was ‘what the people wanted’. As a student in Durham, I can vouch that to buy this album will cost you considerably less than to travel to London to visit the free National Gallery. And it will contain more meaning.